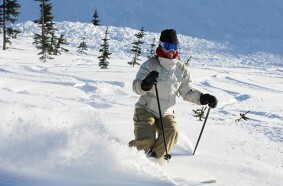 Granlibakken Resort features an intimate ski hill, perfect for beginning through intermediate skiers and snowboarders. It’s a great place to avoid the crowds of larger resorts, while enjoying a day of skiing right out your back door. A rental shop, ski school, warming hut and snack bar are also on the premises. The ski hill, ski school and snack bar are open every Friday through Sunday, every day Christmas/New Years and mid-February holidays. The rental shop, snowplay area and warming hut are open daily all season. Snowpark: Granlibakken snow park offers an area for saucers only. Rentals available, fee charged for day use. Beyond Granlibakken there are many great Lake Tahoe ski resorts to discover. Check out our Lake Tahoe ski resorts map and plan your ultimate winter ski vacation.